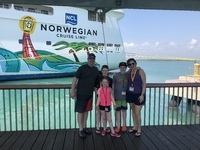 Our party of 7, including 3 children and 4 adults, just finished an amazing 7 night vacation on the Norwegian Getaway! 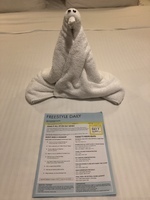 The ship was clean, the staff friendly and the nightly entertainment was AH-MAZING!!! I did my research before choosing port excursions and we were NOT disappointed. Our favorite was the Gumbalina/Tabyana excusion in Honduras. Holding monkeys and exotic birds was a great experience and the beach after was beautiful, clean and safe. The Mayan water park at Costa Maya was a blast for all of us and zip lining was enjoyed by all. Cozumel was another hit with the Mayan ruins and beach/Island overview. We didn’t chose an excusion in Belize, which was a good choice for us since it was a small island (Harvest Caye), with not many options. While the pool was super, seating was hard to find. The beach was not your typical clear beach, with lots of seaweed and rocky/shell terrain instead of sand. Overall though, our ports were very enjoyable. My only complaint about the whole trip was the lack of gluten free options for me. I realize that I am in the minority here, but more readily available options or offers of GF food would have been nice! On several occasions i asked for a GF item at the buffet and waited 15+ minutes for it while the rest of our group started eating. The other members in my group were very happy with the food! 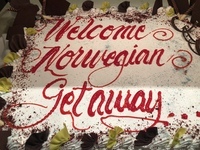 I would not hesitate to recommend Norwegian to anyone and definitely plan to travel with them again!! 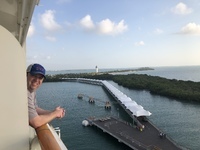 Fantastic cruise line and ship! 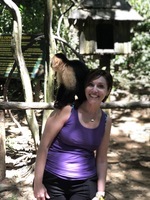 Hanging with the monkey’s in Roatan! Towel animals by the staff! 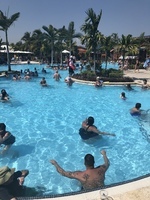 We spent the day enjoying water slides and zip lining, as well as relaxing by the pool at the water park. 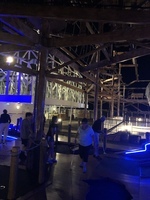 Adults and kids(ages 7-12) both had a blast here!! A short drive on an air conditioned bus, and we were at the Mayan ruins! Our tour guide, David, was very informative. He told us not only about the island of Cozumel, but the ruins as well. We then spent about 90 minutes at a beach a short distance away. There were red flags flying that day ( too windy to safely go in the water) but we played on the beach, relaxed and ate/drank. Overall a good excursion! Bring your water shoes if you’re doing the beach. That part was less than enjoyable but the pool was super- and free!! So much fun for adults and kids alike! So glad we chose this! We did the one with the beach (Tambyana) after. Some reviews of the beach were mixed but we found it clean, safe and very enjoyable! !